The Yungang Grottoes (云冈石窟 yúngāng shíkū), near Datong city in Shanxi province, China are one of the three famous ancient sculptural sites of China. The others are Longmen and Mogao. The sites contains 252 caves and 51,000 statues, they represents one of the earliest peak of Buddhist cave art in China from the 5th and 6th centuries. 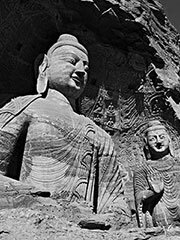 The Yungang Grottoes were made a UNESCO World Heritage Site in 2001.